This is a lesson about writing leads (the beginning of a story or vignette). 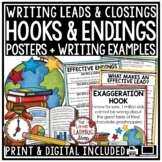 It includes a definition of lead and some great sample leads from famous authors to read and discuss in class. Poster from "The Craft of Revision" unit by Lucy Calkins. Lesson: Writing a Strong Lead. 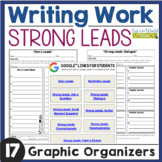 This is a cute poster to hang in your classroom or put in your students folders to remind them how to write a strong lead. 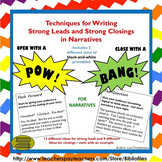 Here is a PPT presentation I made on teaching 4 types of leads in writing: Question, Action, Thinking and Description. I mainly use it with my second graders but it can be used with grades 1-3. This is a simple template for having students practice writing introductions and leads. 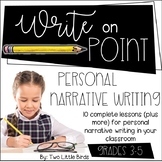 Allows them to write about the same topic three ways and can even be cut up to let them choose their favorite. 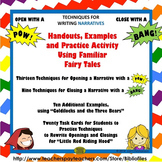 Various ways for students to start their writing assignments. To use with a Writing Workshop lesson on using strong leads. Very authentic, engaging small group work! Students will explore picture books and discuss/decide if the lead used in the book is 1 star or 4 stars!! As creative writers, we want to hook the reader! We teach our students all the various ways to begin a story. Here is a graphic organizer that will help facilitate that process. Your students will read multiple beginnings from rich texts and with a partner identify the authors craft.